Ancient history? Political immaturity? Youthful zealotry? Yesterday she appeared on Channel 4 News, when Krishnan Guru-Murthy probed her desire to see the British state defeated. Her gave the opportunity to prove her patriotism; to tell the country she was wrong: “Do you regret… do you take that back?” he asked. “I’ve moved on since 34 years ago, have you?” Abbot responded, with vague progression and defensive counter-challenge. “Do you take that back,” Guru-Murthy pressed. “I’ve moved on from 34 years,” Abbott clarified by changing the preposition, but without retracting a word of what she’d said in 1984. How is ‘I’ve moved on’ any kind of atonement for sin or reevaluation of error? She’s ‘moved on’ to what, exactly? Why should we assume that ‘moved on’ is virtuous progress? Can’t evil move on to greater evil? “I was elected as a British Member of Parliament in 1987. I was the first black woman ever elected, and I’m proud to say I’m a British Member of Parliament. I have no problem with that at all,” Abbott boasted, seemingly unable to detach pride in her British identity from her ethno-political achievements. So the Britishness by which she has personally been advanced is a cause of pride, but the Britishness by which the state defends itself against terrorists is a cause of shame. On June 9th, this woman could be Home Secretary, and Jeremy Corbyn could be Prime Minister. Jeremy Corbyn, the man who has consistently opposed all anti-terrorism legislation since 1983; who wants to close down NATO; who opposes the replacement of Trident; who isn’t happy with a shoot-to-kill policy; who wants to abolish the army; who welcomes his friends from Hezbollah and his friends from Hamas; who refuses point blank to condemn the IRA unequivocally; and who would have consigned the British people in the Falkland Islands to live under brutal military dictatorship. Christians will have their own justifications for voting Labour on 8th June, one of which might be the complete pig’s ear and dog’s breakfast the Tories are making of their campaign. But let’s be clear that, in the pursuit of the lesser evil, protecting people from being blown to kingdom come trumps a cap on the costs of social care and the price of providing a daily bowl of cornflakes to schoolchildren. Diane Abbott and Jeremy Corbyn believe that only Labour can build a secure and prosperous future; that only they can channel the necessary knowledge and power into ways which can benefit the country as a whole – a nation to which they display a certain moral ambiguity and patriotic conditionality. 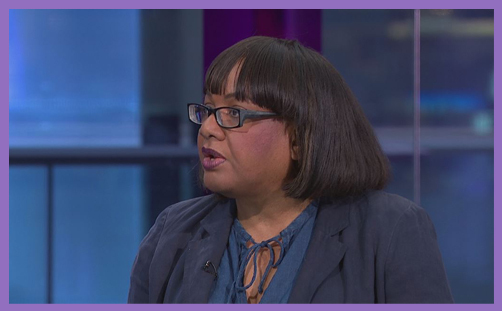 The only acceptable ‘moving on’ from Diane Abbott’s 1984 exhortation of British defeat would be conviction, contrition, repentance, election and justification. In the Christian, this would be a progressive work of sanctification. In the political non-believer, it is still a virtuous transformation, though ‘election’ and ‘justification’ take on different meanings. But how can a Home Secretary foster justice, peace and good government if she still harbours a desire for the British state to be defeated? Wouldn’t changing foreign policy to suit all Jihadi demands effectively hand victory to the Islamists? Wouldn’t Corbyn effectively be vindicating religious extremism? Where does that leave righteous government? Subject to the counterfeit demands of Gerry Adams and the divine precepts of Anjem Choudary? It is a facile optimism that sees in the expansion of socialist knowledge and political power the salvation of the people and remedy to their problems. And it is a dangerous naivety that ignores the fallibility and sinfulness of politicians and their track records: ‘But those things which proceed out of the mouth come forth from the heart; and they defile the man‘ (and the woman).